First off I apologize for the picture quality as these were taken with my cell phone (as were some others in this blog) I will try to get better ones in the future. I took the chunk of mahagony and cut to a little over 3" for the neck. then I re-sawed the thickness to 3/4 of an inch on Larry's bandsaw. I had to make a 15° angle cut for the headstock (where the tuners go) to make the scarf-joint – at the place where the neck meets the headstock (or nut area). I was going to make the heelblock in two peices but cut the wood incorrectly with Larry's saw and ended up redoing this WHOLE process at home with my skillsaw, hand plane and sander. 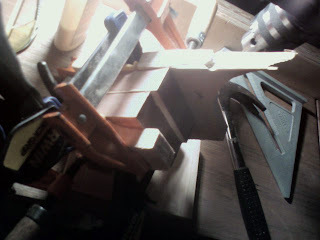 then I glued up the scarf Joint and the heel-block to get to the point I'm at currently, pretty much a neck blank. It turned out perfect and hope it continues to go well from here. 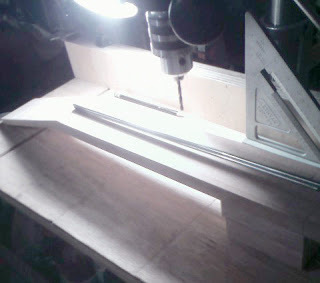 Showing the headstock and neck with the truss rod laying on top. Heel-block is in the shadows. Better photo of the heel-block glue up. Here is the underside of the heelblock being glued. The next step will be to cut out the tenon at the end of the heel-block (where the neck meets the body of the guitar) and then shaping the heel. I will also need to route a slot for the truss rod and create a cap to put over the rod so the fretboard will have a flat surface to be glued to. I can not finish the headstock until I purchase the wood for the back and sides of the guitar (probably brazilan rosewood) because this headstock will have a veneer from this same board. This will be a pricey chunk of wood so I'm going to hold off on that part to save up and pick out a really nice board. 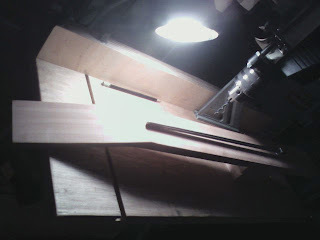 Prior to that I think I will purchase the fingerboard (ebony) and do any inlay, fret slots and other fingerboard work. I think at the same time I purchase the ebony I will also get some spruce shimes for the bracing, we'll see. I like how it's going so far.